From accessories to cuddly stuffed toys, there is a wide variety of gift items for women. But then again, as a man, this huge selection can be quite overwhelming. One important factor to consider when buying the best gift for girlfriend is its sentimental value. It should be something that will remind her of your affection or the memories you share together. Whether you want to randomly give your girlfriend something or surprise her for your anniversary, it should be something that she will remember. Avoid a monotonous sense or predictable items that could kill the surprise. A gift item that a woman needs can also be a lame gift. So, what makes a good gift idea for women? It doesn’t have to be high-priced, but it should be based on her favorites, the occasion, her comfort, and your relationship. This article enumerates three of the top gift ideas today that is suitable for any occasion. Whether you are in a long-distance relationship, married, or have just started dating, each gift item is unique and sends sweet messages. Nothing is more relaxing than a soft, cuddly pillow case. Sleep tight and wake up to a note that reminds you of deep affection that you share despite the distance. 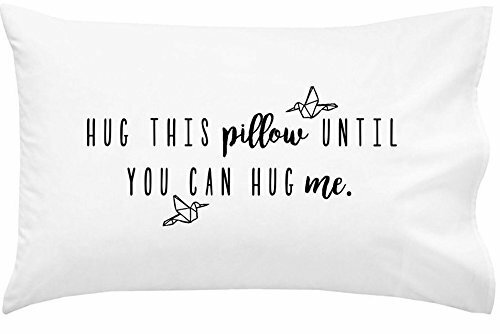 With a sweet message imprinted on that goes, “Hug this pillow until can you hug me”, the Oh, Susannah LDR Pillow Case is especially intended for those in long-distance relationships. Aside from long-distance relationships, the Oh, Susannah LDR Pillow Case can also be given as a gift for different occasions like birthdays, Valentine’s, graduations, and as a wedding gift for newly-wed couples. The Oh, Susannah LDR Pillow Case is a standard, queen-sized pillow case made of 125grams microfiber that is as soft as the 1200t cotton. It is made in the U.S. using high-quality, imported materials. Aside from the silky soft touch, the Oh, Susannah LDR Pillow Case is breathable, allowing ventilation and preventing it from getting too warm. The letters and decorations are imprinted via a permanent fiber-dyeing process and not on scratchy, thin cotton. This adds softness and comfort. The materials and dyeing process are all environment-friendly. In fact, the digital dyeing process is approved by the CPSIA, which means that the imprint will not fade. It is easy to maintain and doesn’t cause skin irritation or trigger allergies. The Oh, Susannah LDR Pillow Case lasts for long years even after several washes. It is machine-washable, dries quickly, and resists wrinkles. It maintains an attractive look to keep the bed organized. Lastly, it is affordable and comes with a great deal. Buy three pieces online, and you immediately save up to 25% upon checkout. If flowers are already too common, another best gift for girlfriend is a flower that can last forever. Is it possible to preserve or keep the flower alive? With the Defaith 24K Gold-Dipped Rose, it is possible. It is an elegant gift item with a touch of nature and longevity. The Defaith 24K Gold-Dipped Rose is actually a real rose flower that is especially treated to maintain its natural look and freshness. The teal blue petals, stem, and leaves are applied with a special pearl surface treatment that is electroplated in 24-karat pure gold for preservation and elegance. Glints with a little ray of sunshine, the Defaith 24K Gold-Dipped Rose sports an attractive look in its natural shape. However, the petals and leaves might slightly wrinkle because of drying and dehydration, but which adds a more natural look. Compared to fresh flowers, the Defaith 24K Gold-Dipped Rose never withers and can keep a lifelong memory from the giver. It can be an excellent addition to the vase or as a stand-alone centerpiece to accentuate a room. The package also comes with a certificate card, greeting card, service manual, and an acrylic moon stand. Busy days are inevitable, especially in the offices. 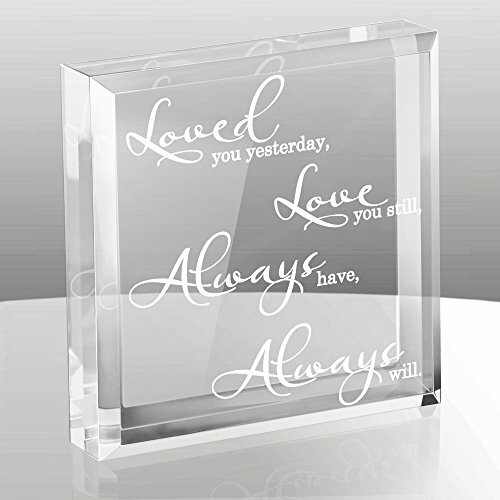 To make your girlfriend always feeling special and secure, this little Kate Posh Glistening Keepsake and Paperweight is a thoughtful gift. It doesn’t have to be a special day to give it, but it must be special. Read further to know more about its features, pros, and cons. Measuring four inches on all sides and being one-inch thick, the Kate Posh Glistening Keepsake and Paperweight provides sufficient weight without damaging the paper or any document. What’s more is that it doesn’t require support because it stands on its own. You will also be glad to know that the Kate Posh Glistening Keepsake and Paperweight comes with a beautiful, glossy gift box and fabric bag. It can be readily given as a gift upon buying. Coming from a reliable brand, this product is guaranteed to be of high quality and popularity, which is what Kate Posh and its handcrafted products are known for. It is made in the U.S., particularly in the California facility. Now that we have presented three of the best gift ideas for your girlfriend, which one best matches your relationship? In terms of durability, elegance, and style, the Defaith 24K Gold-Dipped Rose is probably the best choice for many. 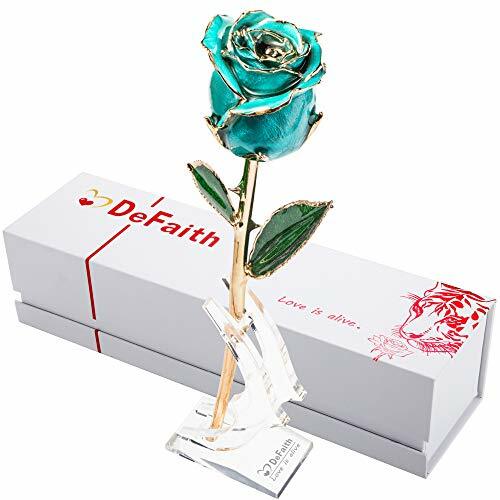 Compared to the other gift items, the Defaith 24K Gold-Dipped Rose is unique and speaks of the undying affection that someone feels towards a special someone. This is not your usual flower that fades in several days or an accessory that can be misplaced after some months. It is a preserved real flower that has the worth of both nature and a piece of expensive jewelry. Meanwhile, the Oh, Susannah LDR Pillow Case is also a good choice because of its features and functionality. As a pillow case imprinted with a thoughtful message, it is soft and comfortable. The reason why the Oh, Susannah LDR Pillow Case is also the best gift item is its affordability and functionality. It will be very useful in addition to the elegant design and touching message. Plus, any woman would love hugging something from his man.